A VERY heavy piece of the history of Helensburgh Central Station was returned to the station in May 2008 — thanks to Helensburgh Heritage Trust. When the Church of Scotland decided to close the Clyde View Eventide Home on East Montrose Street, they offered to the Trust an old station bench bearing the word Helensburgh, which must have been in use at the station in years gone by. The bench had been placed in the grounds of the Home, and was often used by residents to relax and enjoy the view. 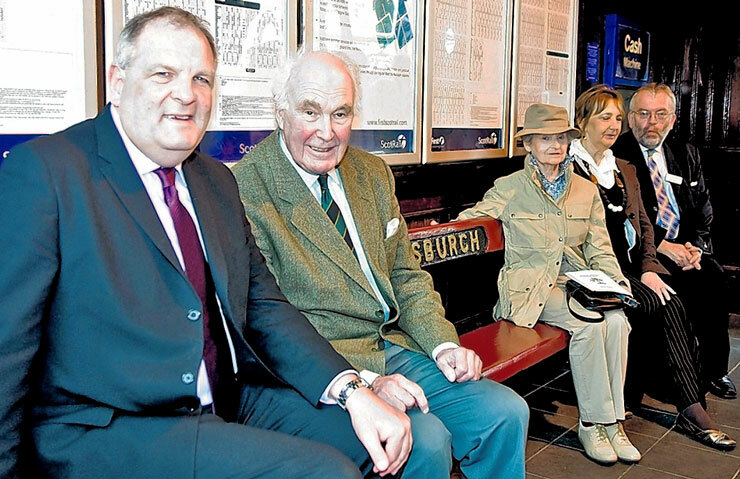 The Trust directors agreed to purchase the bench for a nominal sum, and offered it on long term loan to First Scotrail, who refurbished it and placed it in the station's booking office waiting area, where it is under lock and key at night when the station is closed. In a brief ceremony it was formally presented to First Scotrail's external relations manager John Yellowlees (left) by Trust director and company secretary John Johnston (second left). The ceremony also marked the 150th anniversary of the opening of the Glasgow, Dumbarton and Helensburgh Railway — which was the subject of a Trust exhibition in the library throughout the month. Mr Yellowlees said: "The bench is a symbol of the excellent working partnership between Helensburgh residents and the railway, and we are proud to play our part in marking the 150th anniversary." Plans for a rail link to the town were first mooted in 1845, and by 1855 the Glasgow, Dumbarton and Helensburgh Railway Company was authorised by Parliament to form a junction at Dalreoch for track to the town. The new rail route, single track at that time, opened on May 28 1858, initially for goods traffic, but less than a month later received passengers for the first time. The original station was in George Street, and the present station building was erected in 1889. At that time it was simply Helensburgh Station, but in 1953 it was renamed Helensburgh Central. Photo by courtesy of the Helensburgh Advertiser.